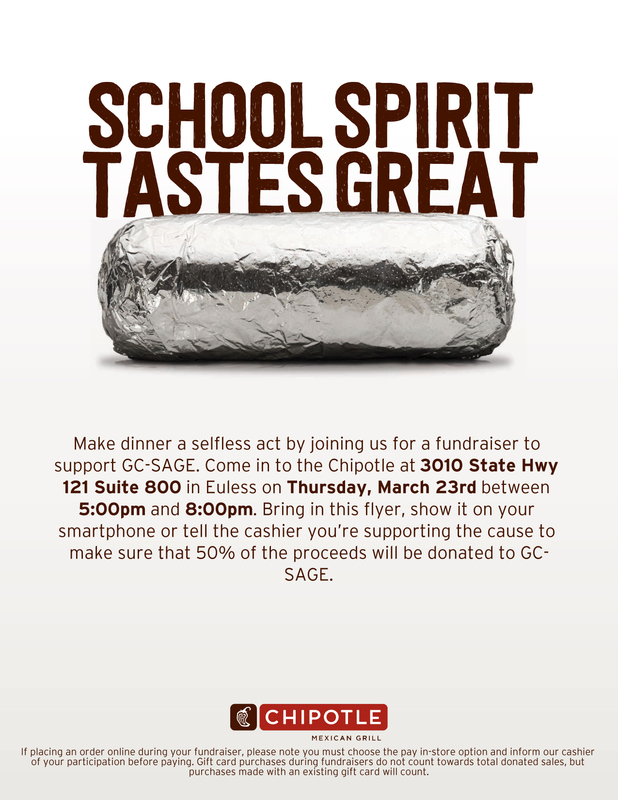 Thursday, March 23: Chipotle fundraiser, 5 to 8 p.m.
Make dinner a selfless act by joining us for a fundraiser to support SAGE! Come to Chipotle in Euless (Highway 121 and Glade Rd.) on March 23, 2017, between 5 and 8 p.m.
Show the image on your smartphone, or tell the cashier you’re supporting SAGE to make sure 50 percent of proceeds will be donated to SAGE. Your support of SAGE fundraisers provides grants for teachers to attend conferences to increase their understanding of gifted education, and scholarships for graduating GT seniors. Thank you!